Making the big step to pop the question in any relationship can feel like an overwhelming experience met with indecision, impatience, and excitement. Deciding on the perfect ring to symbolize the love you share with your significant other can be a challenge that some find too intimidating to tackle. Below we have a few tips to help you decide on the perfect ring, and get you down on one knee asking your soulmate to be yours forever in no time. Asking your partner the style of ring they want may seem like the perfect way to remove any ounce of surprise from the proposal, but it can help to get an idea of what they might like. They have to wear this ring everyday, so most brides are actually taking it upon themselves to choose the exact ring they want ahead of time. If you would rather still have an element of surprise though, sit down with your partner to research different styles of rings and pick a handful of options, but leave the final decision up to the proposer to keep the proposal itself a secret! This way you ensure you have the right ring, without completely ruining the excitement that comes with a surprise engagement moment. Check out these fun and exciting engagement ideas that allow you to filter your ideas, so you are prepared with the perfect way to pop the question! When it comes time to shop for the ring, there are many factors to consider to find the right one that reflects the love you share between the two of you. It also becomes more challenging when wedding bands are added to the shopping list as well. There are so many colors, styles, and unique ways to pair your rings, it may seem daunting to find the right fit. Before heading to the jewelers, look up options online and make a list of you favorite materials, diamond shapes, and consider adding a personal touch to your wedding bands with a quote from you and your partner. This can be engraved on the inside of the band and make the rings even more special and unique to you. When it comes to choosing the material, to prevent damage to your ring, make sure it can withstand your daily tasks and routine. Stronger metals or flexible materials are preferable for those who are more hands-on for safety. Color is also something to consider, with metals coming in a handful of trendy colors like rose gold. Consider your partners personal style, and don’t be afraid to have differing wedding bands that are more unique to your individual styles. This is an on-trend way to pair your rings, and gives you and your partner freedom to choose the ring that’s best for you. Stacking is also another thing to consider when it comes time to buy your rings. Stacking will make your engagement ring fit perfectly against your wedding band, and can also help if you are more hands on, making for a more flush fit to your finger. Check out sites like Blue Nile, that have an extensive selection of engagement ring options that come with matching stackable wedding bands to match. Most brides opt for a wedding band to match their engagement ring materials when stacking for a more cohesive look, but don’t be afraid to go bold with a more customizable pairing! 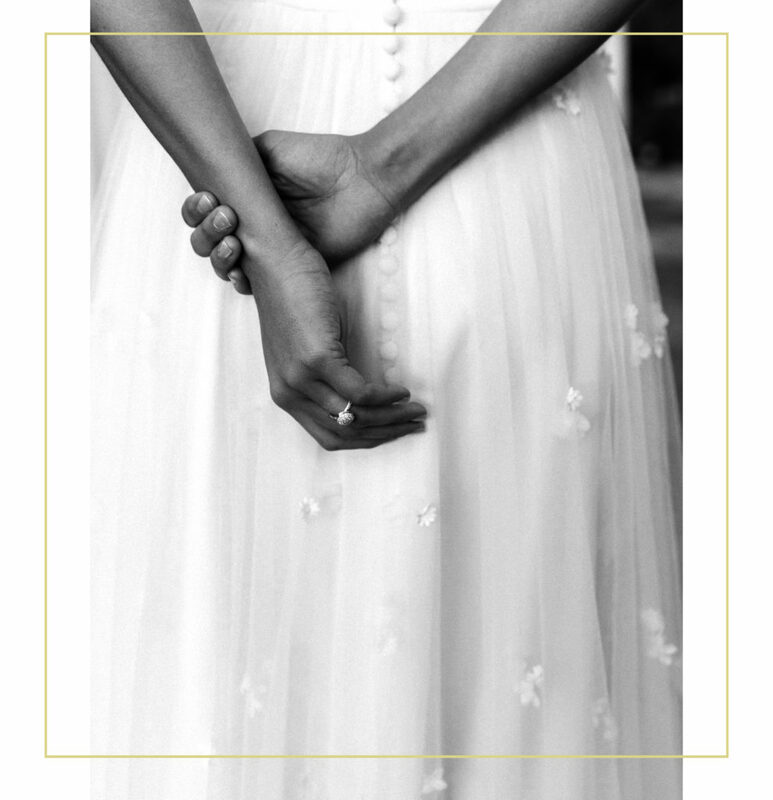 Give yourselves plenty of time prior to the big day to choose the perfect rings, both engagement and wedding bands. This way you wont end up in a time crunch when it comes time to size your rings with your jeweler. Talk over timelines and the sizing process with your jeweler ahead of time to make sure they have plenty of time to make any sizing changes or customizations.